Ada pertanyaan untuk La Fusion Garden Resort? Terletak strategis di Dumaguete City, La Fusion Garden Resort adalah tempat ideal untuk memulai menjelajahi Dumaguete. Hanya 1.8 km dari pusat kota, lokasi hotel yang strategis ini memastikan para tamu agar dapat secara cepat dan mudah mencapai ke tempat-tempat menarik. Dengan lokasinya yang strategis, hotel ini menawarkan akses mudah ke destinasi yang wajib dikunjungi di kota ini. Dengan menawarkan pelayanan superior dan sejumlah fasilitas kepada para tamu hotel, La Fusion Garden Resort berkomitmen untuk memastikan penginapan Anda senyaman mungkin. Untuk kenyamanan para tamu, hotel ini menawarkan WiFi gratis di semua kamar, resepsionis 24 jam, Wi-fi di tempat umum, tempat parkir mobil, antar-jemput bandara. Suasana La Fusion Garden Resort tercermin di setiap kamarnya. produk pembersih, cermin, handuk, akses internet - WiFi, akses internet WiFi (gratis) hanyalah beberapa dari fasilitas yang dapat Anda nikmati. Disamping itu, hotel memiliki berbagai pilihan fasilitas rekreasi yang menjamin Anda melakukan bermacam hal selama menginap. Nikmati pelayanan tidak terbandingkan dan penginapan yang sungguh bergengsi di La Fusion Garden Resort. Stayed in double room with a/c and bathroom and later double room with fan no bathroom. Rooms were basic, clean, average bed. This is not a resort! Feels like a hostel or guest house. They have a big common area with sofa and dining table, large kitchen with everything you'll need to cook and a big garden with many plants. Quiet area and homey feel in the house. Very bad WiFi. WiFi is very weak and unusable. So. Please do not use those who do business. I really enjoyed our time here! It felt homey, cozy and the staff were really accommodating and helpful. Why can't I rate this hotel with 6 stars? This hotel had the best stay I've had out of any hotel: 5-star hotels, 4-stars etc in Philippines because of the following facts: 1. Anyone is allowed to keep their food / drinks in the group kitchen in the main building to cook their own food, have cool beer, or cool wine, or juice available for them 24 hours per day 2. The air conditioner cools down the room after 8 hours to your comfortable 16 degree celsius temperature if you're like me and you're from the west, used to Air-con rooms. Tip: Wait 8 hours, and close all doors for it to cool down that much. 3. Washing service available for your clothes at a very low price. They washed my suit at 30 pesos and it was very clean and nice afterward. 4. The personell, this place is owned by Mattios an Italian man and Mathew a Japanese man. They are both very kind and wish the best of their guests in the hotel, or should I say 'Bamboo apartment.' I hope you enjoy this 'bamboo apartment' as much as I do, and please remember have at least a one-day patience (about 8 hours total) for the room to cool down completely if you're Air-conditioning sensitive as I am in Philippines and need the AC to survive. Slept in mixed 4 bed dorm with ice cold AC. Room was spacious enough both for me and the ants I found on my pillow. Breakfast was unmemorable though free water refills and use of a kitchen always helps if you want to make your own I guess. Bathroom facilities is really what let’s the place down. There’s only 2 showers and 2 toilets. For the entire hostel. All were outside and had dog paw prints over the floor. It is cheap but it is a little dirty. And Place is not good. There is a stinky old man at the customer. When we first arrived we were disappointed with La Fusion, we booked a double, but got a twin, and the whole place wasn't quite how it seemed on Agoda. This place has more of a hostel vibe than resort, it could be a really nice place if it was maintained better. We stayed for 6 nights, and the longer we stayed the more we enjoyed La Fusion. We met some nice travellers, and enjoyed the quiet away from the hussle and bussle of Dumaguete. indifferent check-in without any explanation of facilities available (eg laundry when we desperately needed). reception area was being repainted. seemed very quiet. we thought we were the only guests but others appeared at breakfast. the main drawback of this place is the location, a good 15-20 minute walk from the town. The airconditioner of the room I booked was not getting the room cold enough. I manually operated it so that I can get the temperature I want. The room I got has no television and the floor was made of bamboo which made me a little scared whenever I walk. The comfort room has cold and hot shower but there were many mosquitoes flying. That's why I had to apply an insect repellant. It's at least 1.5 km away from the city center. It's also a bit inaccessible by tricycles. It almost pushed to walk to the city center. 1. Most of the decorations are white, it is very clean everywhere. 2. There is a big kitchen available, u can cook food with friends together like at home . 3. It's a big area but just only serval rooms , everywhere is wide and bright . 4. The boss and the waiters are very good and friendly . 5. There is one thing can be better that the water is not stronger enough when u r taking shower . 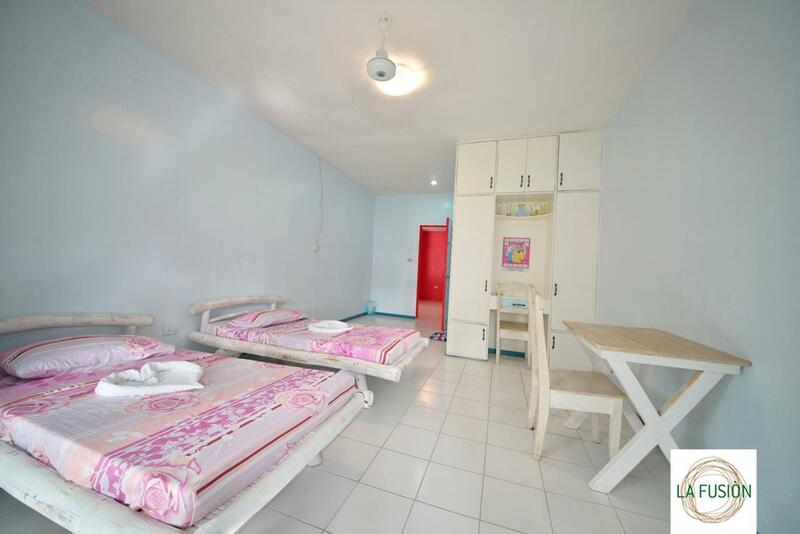 The rooms were very clean here, and the common areas are very pleasant. It stays pleasantly cool under the shaded patio even in the middle of the afternoon. The internet is pretty quick here as well. Breakfast and coffee are both good, as well. The location is a mix--it's far enough out of the town center to be pleasantly quiet, but also far enough that pedicabs don't always want to take you back. There are some restaurants within walking distance, in particular Joe's Inato Chicken, which is maybe 5-10 minutes away by foot, and serves excellent grilled chicken. 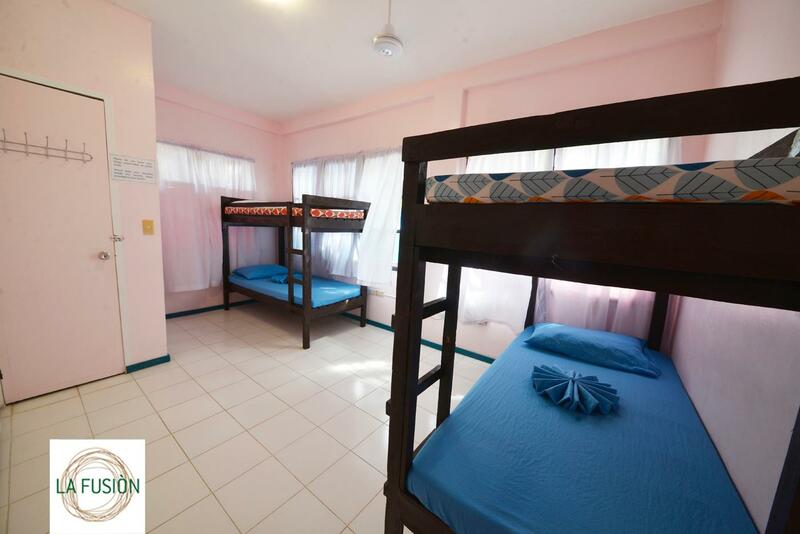 Came to Dumaguete one night ahead of my reservation at Gabby's Bed & Breakfast, and got a bed in a 3-bed dorm. I enjoyed the design of the palce and the back patio was a nice gathering spot. 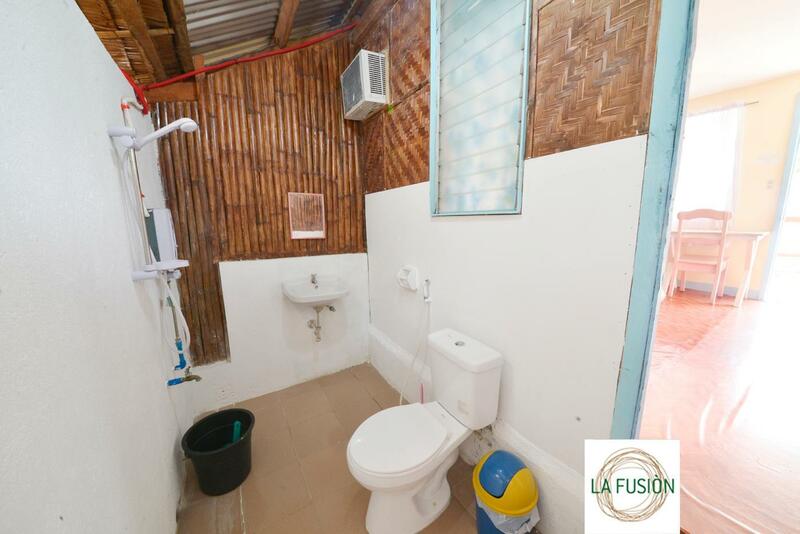 The room has air conditioning, and its own toilet/shower in an adjacent room. WiFi is decent, and there's a shared kitchen. The food from the restaurant looked good, but I didn't get a chance to try it. It's only 8 or 9 pesos to take a trike to the waterfront and downtown, but it's far enough away that you won't smell or hear all the traffic. On the downside, there are no lockers, and the three of us in the room had to share a single key (which we left at the desk on heading out), so you'll have to just trust your fellow travelers if you stay in a dorm. though my expectations were set before checking in, I was a bit disappointed on a few things. The water supply was so slow that it took me and my husband a lot of time to shower. and the air-condition was not working it was hot inside the room. Be ready to hear all the noise outside and the room beside you if you have noisy neighbors. The design of their rooms is meant for you to hear all of it. The location is near the airport but not for the tricycle for transportation around the city. we always had to wait a long time for a ride . staff was really nice but te place os for backpackers and those who do not plan to stay long. We stayed in the "native air conditioning room" which didn't look like on the pictures. The bed was old and squeaky and the linens really thin. The bathroom is not fully closed so mosquitos can get in and also into the room. The "bathroom" is also really hot because of the backside of the aircondition. The breakfast which is included was ok, but nothing special. They also offer dinner meals, but nothing vegeterian. When I asked for a vegeterian option they said no, so we had to find something else. The location is not really close to the main area and is pretty dark at night. We didn't feel comfortable in the room at all and only stayed for two nights. We cannot recommend staying here and would rather pay a bit more for a more comfortable accomodation. It's a good place if you want to do nothing and hang out by yourself. The wifi is decent but cuts in and out, there was no one there to meet - for good reason - the food was bad, the rooms were hot, with no lockers, or a lock for the door and the bed was so uncomfortable I could not sleep. The bathrooms were smelly and you could smell them when you were on the patio. It was at least a kilometre walk to town. I wouldn't stay here again if you paid me. The place is between the city and the airport, so you really need a ride either way. If you want to relax, staying here is a good option. They even let us use their kitchen when we buy food from the market. But the problem I encountered was the time they let more people in a room beside us, so our shared bathroom was most of the time busy, and I have to go outside to use the other bathroom which I found so inconvenient. Lastly, I can say that the Filipino Staff were very friendly and accomodating. Thanks. we stayed 1 night to make a trip to Apo Island. Rooms are basic but clean. Hotel has a shared kitchen if you like to cook by yourself. Location is not perfect. One would have to take a tricycle each time not accessible by foot. Located half way from airport to city center.